The footage actually shows an art installation in Spain and the currency notes seen in it were reportedly painted by hand. 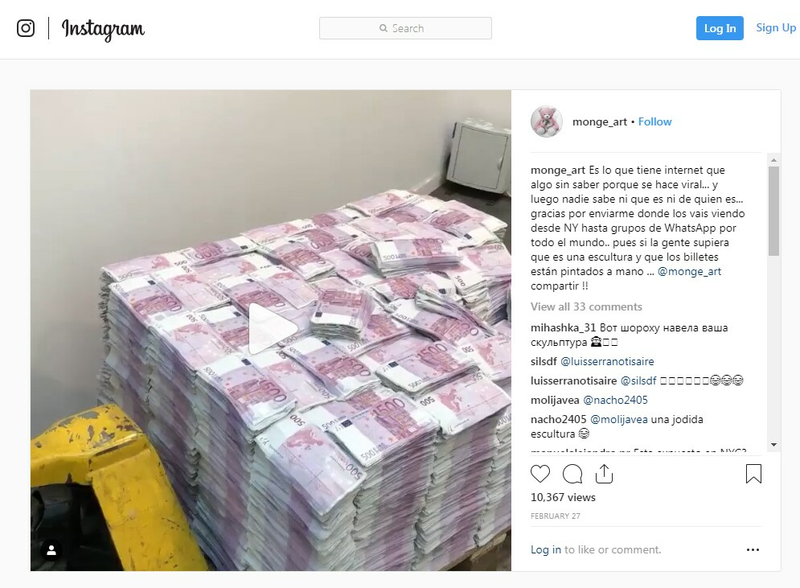 A video that appears to show piles of bank notes has been viewed thousands of times on Facebook, Twitter and YouTube this election season. The video claims to show cash recovered from the homes of opposition politicians. 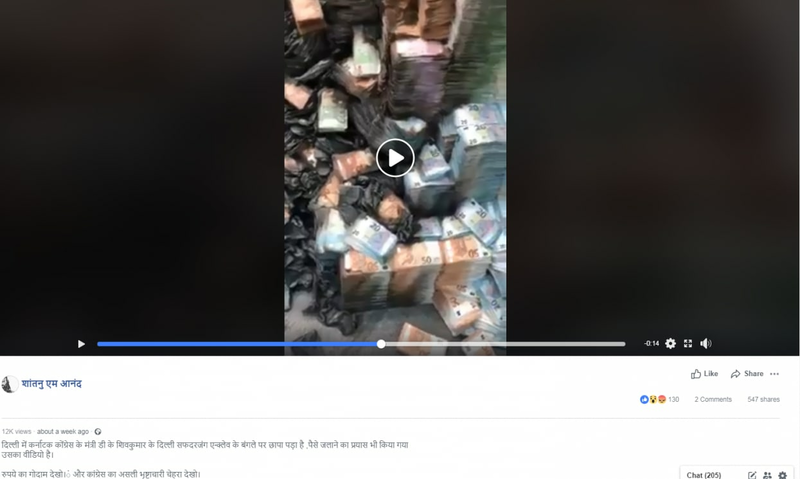 The exact same footage has been used repeatedly before in other misleading posts which claim it shows money stolen by politicians in countries from Cameroon to Pakistan. All of the claims are false -- the footage actually shows an art installation that was displayed in Madrid in February 2018. The video was shared on April 2, 2019 and has since been viewed more than 12,000 times in a Facebook post which claims it showed cash seized at the house of Congress minister in Karnataka, DK Shivakumar. Screenshot of the video in the misleading Facebook post. The video and misleading claim have been shared repeatedly on Facebook, Twitter, and YouTube with a similar claim. The exact same footage was shared in another misleading Facebook post published on April 8, 2019, which claims it shows a stash of cash found at the home of Madhya Pradesh CM Kamal Nath’s secretary. This claim has also been shared repeatedly on Facebook, Twitter and on YouTube. Both claims in the misleading posts are false -- the footage actually shows an art installation in Madrid, Spain. The footage was originally posted on Instagram on February 27, 2019 by a user called Alejandro Monge. Screenshot of the Instagram post. 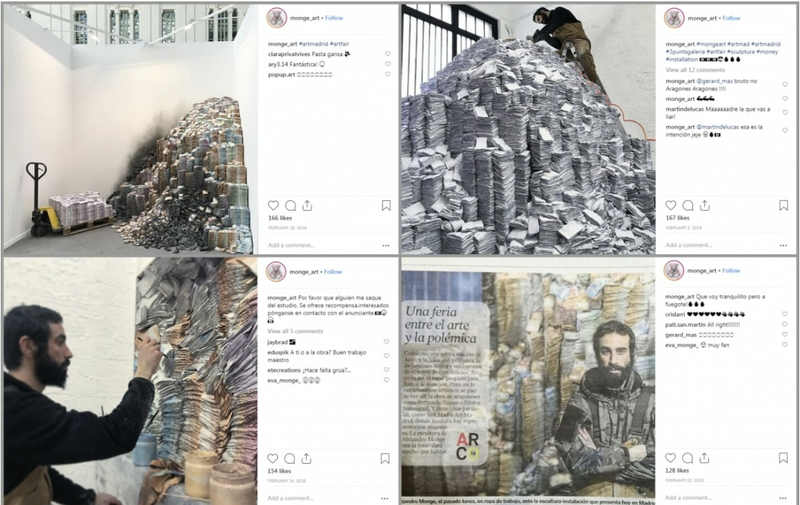 The Instagram post's caption, in Spanish, refers to the rapid spread of misinformation online and says the 500-euro notes seen in the footage were painted by hand. The caption translates to English, in part: "It's one of the things about the internet that something can go viral without knowing why it does… and then nobody knows what it is or who it is from". It also says: "If people knew what a sculpture is and knew the tickets are painted by hand… @monge-art share!!" Alejandro Monge describes himself as an artist based in Spain on his official website. Monge's installation, titled "The European Dream 2", was displayed at the 2018 ArtMadrid contemporary art festival, which ran from February 21-25, 2018, according to the festival's online catalogue here. Marta Suarez-Mansilla, deputy director at ArtMadrid, told AFP by email: "We can certainly confirm that this artist participated in our former edition of Art Madrid Contemporary Art Fair". Monge posted multiple photos and videos of the artwork on Instagram in February 2018 from different angles, showing how it was made, and of media coverage of the exhibition. Screenshots of four Monge's Instagram posts showing the installation. AFP has found multiple other examples of the same video of Monge’s work being used to make similar false claims in other countries. For example, Facebook posts carried the same video in the context of a claim that the wife of a politician in Cameroon tried to burn 60 million pounds sterling to prevent police from finding it. Similarly, several Facebook posts were posted with claims that the stash of cash was recovered from Pakistani politician Agha Siraj Durrani’s house in March.